Junior forward Summer Hemphill lays it in. Hemphill will miss the majority of non-conference play after being ruled academically ineligible. Women’s basketball junior forward Summer Hemphill was ruled ineligible to compete during the fall semester, announced on Thursday night by UB Athletics. 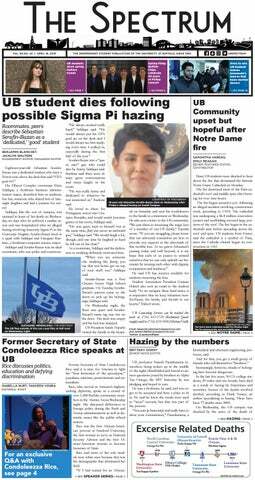 Hemphill, a social sciences major, failed to uphold institutional academic rules and was declared academically ineligible. Hemphill was poised for her best season as a Bull, despite having a career year in 2017-18. As a starter on the Bulls team that went to the Sweet 16, Hemphill led the Bulls with 7.3 rebounds per game and finished fourth in points per game with 10.1. Against Ohio, Hemphill broke the school record in rebounds with 23 on Feb. 24. In Thursday night’s opening exhibition against Bloomsburg, Hemphill was replaced in the starting lineup by senior forward Courtney Wilkins. The Bulls would still defeat Bloomsburg 94-53, with senior guard Cierra Dillard accounting for 27 points. Hemphill will now miss the majority of the non-conference schedule. Hemphill along with Dillard were named to the preseason All-Mid-American Conference team a day prior to the announcement. Hemphill was also named to the All Big-4 first team Friday. Hemphill will be eligible to return at the conclusion of the fall semester on Dec. 18.